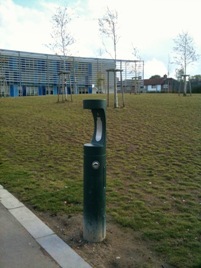 Drinking water fountains has undertaken the installation of many outdoor drinking water fountains throughout the UK . From basic wall mounted models through to the mighty Halsey Taylor Bottle filling stations. Our team will look after your project from the planning stage through to completion. A member of our knowledgeable staff is always just a call or email away. We have vast experience in the industry and have worked with most of the leading fountain manufacturers and their products.